"Hello. My name is Roly. I'm a donkey. Let me tell you about the time during the First World War when I worked at a place called Gallipoli. I met a man there from New Zealand who was very special. He and I worked as a team to help rescue soldiers who had been hurt in battle. Base... read full description below. Hello. My name is Roly. I'm a donkey. Let me tell you about the time during the First World War when I worked at a place called Gallipoli. I met a man there from New Zealand who was very special. He and I worked as a team to help rescue soldiers who had been hurt in battle. Based on real people and events, this is the heartwarming story of Richard Alexander Henderson, a soldier in the New Zealand Medical Corps, and the donkey he discovers wandering and hungry on a Gallipoli road. Richard and Roly form a strong friendship and, working together, they courageously save the lives of many wounded soldiers. But now the army has received top-secret orders to leave Gallipoli - and quickly. All the donkeys must be left behind. Richard is heartbroken. What will become of his dear friend Roly? Glyn Harper and Jenny Cooper are the author and illustrator of the hugely successful picture books Le Quesnoy and Jim's Letters. 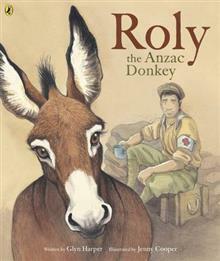 Roly the Anzac Donkey is a moving retelling of Glyn Harper's 2004 story The Donkey Man, reinvigorated for a new generation of children with Jenny Cooper's beautiful illustrations, and commemorates the 100th anniversary of the Gallipoli invasion.